Wallpaper was popular decades ago, then faded out of style. But like all design trends do eventually, it’s coming back! Wallpaper has been growing in popularity recently, and we keep seeing beautiful examples on Instagram. Wallpaper is cool, but you probably already know all about it. Today we want to introduce you to its hip younger sister: wall stencils. 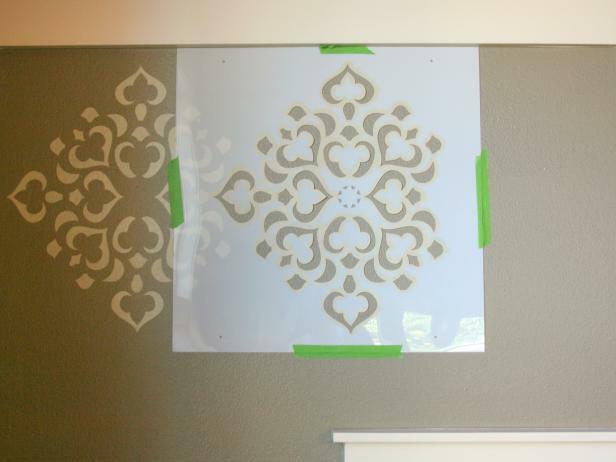 Stencils are also a fraction of the price of wallpaper — the stencil itself will cost around $40 (they range from $8-50 based on size and complexity). The only other materials you need are some paint, a brush, and tape. Wallpaper could run you upwards of $400! Repeat steps 4 and 5 until the entire wall is covered! You’ll want the edges of your design to be sharp, so be careful not to get paint underneath the stencil. The best way to do this is to press your fingers down on the stencil near the area you’re painting, so it doesn’t separate from the wall. Dab the brush in the stencil openings instead of gliding the brush over them. Use as little paint as possible so it doesn’t drip when you remove the stencil — two thin coats are better than one oozing one! Still have questions? Email us at hi@decoratorapp.com. Also…tag us in photos of your lovely stenciled walls on Instagram @decoratorapp!